When the University of Louisville squares off against in-state rival University of Kentucky, there’s always more than a win on the line. The 2015 Battle of the Bluegrass in front of 4,507 fans at Dr. Mark and Cindy Lynn Stadium Tuesday, September 8th was no exception, where the 23rd ranked Cards shutout the 15th ranked Wildcats 2-0. After over 20 minutes of limited chances for both teams, the Cards jumped ahead quickly with two goals in within two minutes of each other. Tate Schmitt capitalized off a Wildcat misplay in the box for a shot that hit off the right post and then ricocheted off the back of the goalie’s head for his third goal of his freshman season. Two minutes later, Schmitt was attacking again, this time dishing it off to junior Daniel Johnson, who celebrated his 20th birthday with his first career goal to put the Cards up two, which held throughout the match. 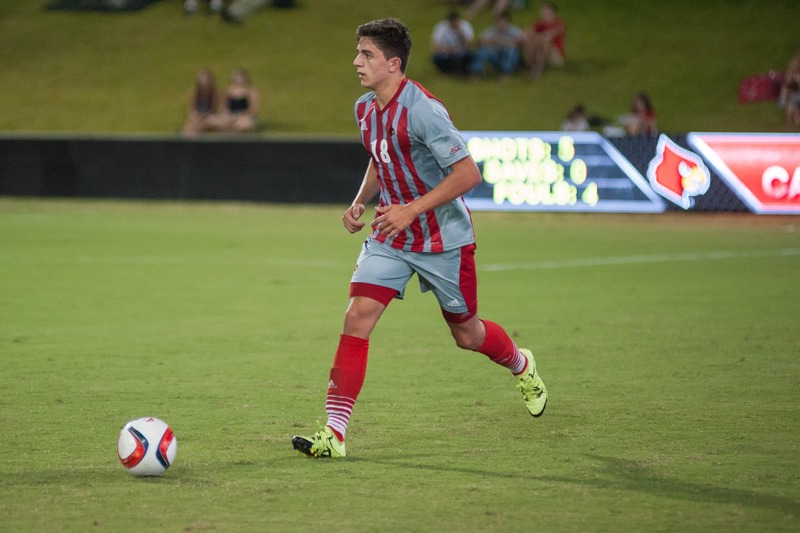 The Cards dominated the whole match, holding a 15 shot advantage in what coach Ken Lolla called their “best performance for 90 minutes.” The Wildcats never seemed to have a chance. Louisville’s back line was strong the whole match, allowing only two shots to the Wildcats, neither of which reached sophomore Nick Jeffs as he recorded his first career shutout without having to record a save. In the 66th minute, tensions rose with a scuffle at midfield. Three yellow cards were handed out–two to Louisville and one to Kentucky. Schmitt and Romilio Hernandez of Louisville and Kevin Barajas of Kentucky were issued yellow cards. The fight highlighted the tension between these two teams and ignited new passion in the match. Neither team could turn that passion into goals, and the match ended at 2-0 with the Cardinals on top. The win was Louisville’s first shutout of the season, and its third in four games. Louisville has won five of its last six matches against the Wildcats. The Cardinals face off next against Syracuse Friday night at 7 p.m.